I’ll start off this week’s notable new releases with a couple of apps for the little ones. Little Speller is an interactive preschool game that helps your child learn to read, write, and spell words. One of the coolest features of this app is the ability to not only add your own words and images, but to also record your own voice. This way it’s like you are always there teaching your child even when you can’t be. Puzzld! To Go offers up some beautiful looking wooden puzzles for your kids to solve, with multiple options to increase or reduce the difficulty level. A few classic arcade titles and console franchises make there way to the iPhone this week. First we get Namco’s popular cat and mouse infused platformer MAPPY. We also get a reboot of the side scrolling beat’em up classic DoubleDragon, complete with Bluetooth multiplayer action. It’s been about 4 years since we’ve seen a new title in the Speedball game series, but now Tower Studios’ Speedball 2 Evolution, brings back this crazy futuristic sports title which is a mix of football, ice hockey and rugby. Speaking of brutal sports, Electronic Arts brings their hugely popular Fight Night series to the small screen with Fight Night Champion by EA Sports™. Finally, rounding out the new releases is a bit of casual fare. 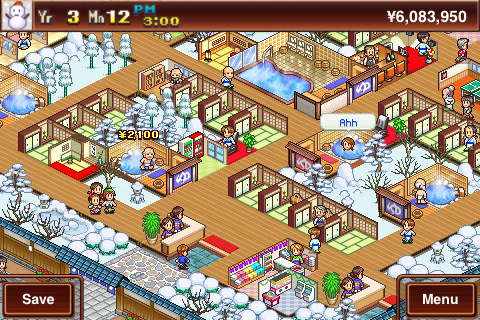 Lightning may strike twice for Kairosoft, the brains behind the insanely addictive Game Dev Story, are back with Hot Springs Story, a similar type of game, this time tasking players to build and manage the ultimate Japanese hot springs inn. ShockPanda Games’ debut title Space Bunnies will have you flying through space and blowing stuff up. FunArts’ Home in one could satisfy mini golf fans looking for something a bit quirky, while Camigo Media’s Pig Rockets may appeal to both puzzle and tower-defense fans alike. Trigonon looks like an appealing and surreal puzzle game which “leads you into an amazing journey inside the factory of your mind”. Finally if you just like throwing stuff you may want to check out Can Knockdown 2, the sequel to Infinite Dreams’ Can Knockdown (which was released last December).